From preserving the food and trade of a prosperous Pre-Hispanic civilizations, to funding a liberator’s fight for independence, all the way to astonishing modern tourists and worshippers with its marvelous ornamentation, the Zipaquirá salt mine in Colombia has had a rich history. The salt deposit has its origins in an inland sea that covered the region some 250 million years ago. When the sea dried up a large salt deposit was left behind in the mud and this eventually solidified to become giant rocks of salt. As people began to inhabit the region they soon found a purpose for all those salt crystals. Although there are still large quantities left, the salt mine has been heavily exploited over the years. 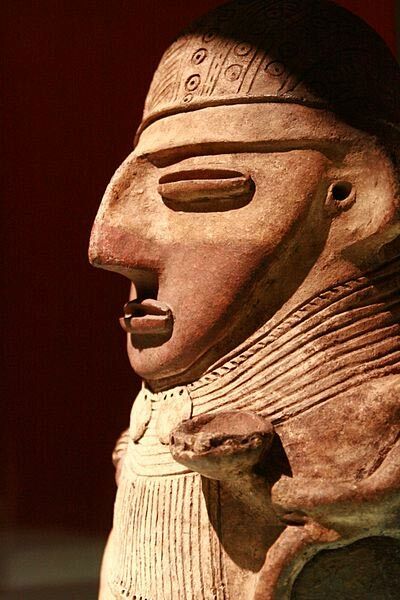 The first to have shown a strong interest in mining the site was probably the Muisca civilization. The Muisca peoples are recognized as having one of the more advanced pre-Hispanic civilizations in the Americas, thus it is not too surprising that they were able to use the natural resource to their advantage. When the Spanish conquistadors arrived in the area in 1537, they found themselves in the land of the Muisca leaders and were likely astounded by what they saw. The Muisca society was partly based on agriculture, but people mostly dedicated their time to the mining of emeralds, gold, coal, and salt. It was the salt, however, which helped the Muisca indigenous peoples to become some of the most prosperous pre-Hispanic peoples. One of the possible reasons salt had such a high status for trade could have been for its use in food preservation (and preparation). For a long time, it was believed that the Muisca and other local pre-Hispanic peoples led a nomadic lifestyle, but now it is mostly accepted that some of the indigenous people, such as the Muisca, also lived in permanent settlements which were maintained for hundreds of years. The Muisca people had a large population before the Spanish conquest and a Confederation of territory of approximately 47,000 sq. km (18,000 sq. miles). The legend of El Dorado , the famous city of gold, may have also originated from their culture. The salt in Zipaquirá mine comes from what one researcher has called essentially “a mountain of salt”. The process the Muisca used to obtain the final product was relatively simple: chunks of the mineral were removed and mixed with water and placed in large clay pots. The pots were then heated and when the water evaporated the salt would remain in the pot. This solid mass could then be broken and transported as “loaves” of salt. This procedure to obtain salt remained pretty much the same for centuries with alterations mostly coming in the form of larger pots and fires. The indigenous people continued to have a strong hold over the salt production in the area, which made the Spaniards uneasy. The Spanish conquerors had been proven as ineffective in managing the salt exploitation, but changes to the salt production were on their way when Alexander von Humboldt arrived in the early 19th century. Von Humboldt introduced the ideas of mines and tunnels for rock salt extraction and sped up the production process while doing away with the traditional methods of exploitation. Oxen, followed later by streetcars and railcars, carried the larger quantities of salt from the mines. By the early 20th century vertical excavations had already taken hold. Although debated, some researchers suggest that the name of Zipaquirá may have its roots in “Zipa” from the local name for Muisca chiefs who ruled the area near present-day Bogotá. The village of Zipaquirá was founded in the 1600s, making the town one of the oldest in the country. Apart from the salt mine, Zipaquirá contains or is located near other sites of interest for archaeologists and historians. For example, the archaeological site called El Abra is believed to have been the home to some of the earliest inhabitants in the Americas. This site has been dated to about 12,000 years ago. Another place of interest for tourists visiting Zipaquirá is an old house where the famous military and political leader Simón Bolivar lived during the war of Independence. Bolívar is also believed to have exploited the local salt mine to fund his fight for the independence of Colombia, Ecuador, Peru, and Venezuela. The old National College for Boys is also a popular site in the city. It is where Colombian novelist, short-story writer, screenwriter, and journalist Gabriel García Márquez lived and was educated from 1943 - 1946. 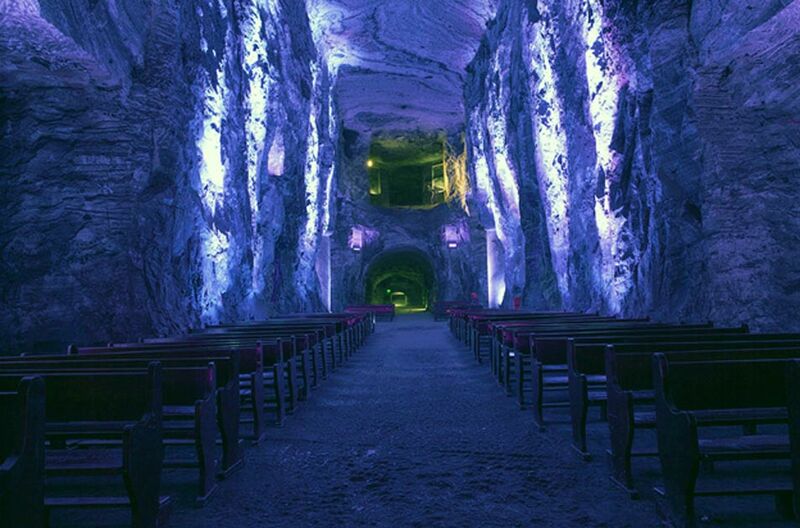 However, the most popular attraction for tourists is undoubtedly the salt cathedral which is housed within the salt mine 180 meters (590.55 ft.) below the earth’s surface. The first Catholic church was opened to the public in 1954, but safety concerns closed it in 1992. The popularity of the site had apparently already taken hold however and a new cathedral was opened to the public in 1995. There are several carved salt sculptures found within this newer cathedral, including a 4.88 meter (16 ft.) high cross that stands behind the main altar. These churches were not the first devotional sites in the mines however. Scholars believe that the earliest miners likely worshipped in the caverns below the surface as well. Researchers suggest that the miners practice of hanging of religious imagery may have led to the first Christian shrine in the salt mines. But looking for divine help and safety is definitely not just a modern idea and one would not be surprised if the ancient Muisca miners asked for protection and aid from a benevolent deity while they toiled away under the earth’s surface long before the Spaniards and their religion took hold in the region. Caputo, L., Newton, P., and Richard McColl (2008). VIVA Travel Guides: Colombia . Kohn, M., Landon, R., and Thomas Kohnstamm (2006). Lonely Planet: Colombia.